July 16th – Art Opening “Draft Urbanism”at the McNichols Building, (Colfax & Bannock) 7-9pm, International artists and architects examine the evolving relationship with the urban fabric of our cities. Meet the curators and artists behind the Biennial installations and celebrate public art. July 17th, “Canada Night” at Sustainability Park (26th & Arapahoe) 7-11pm, A public block party exploring the intertwined concepts of energy and sustainability through food, fun, and music. July 18th, “La Noche De Mexico” in Civic Center Park, 6:30-11pm, with family activities, traditional dance performances, and a screening of the movie “Bajo la misma luna” (Under the Same Moon) from the Denver Film Society. 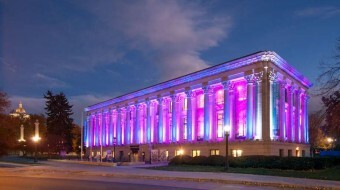 July 19th, “Denver Night”! Civic Center Park, 7-11pm. This is the big one, I can’t wait! An evening of music and art featuring an eclectic concert of folk, classical, jazz, rock & avant-garde music, video art, sculpture, and dance. It kicks off with a performance of artist Nick Cave’s horse soundsuits, followed by a dog opera accompanied by the Colorado Symphony Orchestra, and acoustic performance by members of the Fray. Not to be missed! I will be updating this post with the weekend’s art openings on Wednesday as well, so check back! Get out there and have some fun this week Denver! Enjoy the Biennial. This entry was posted in art, Denver, lifestyle and tagged art, art district, art walk, biennial of the americas, budget, Denver, denver art, denver biennial, free events denver, free this week denver. Bookmark the permalink.